← Take care of yourself! I was watching the Olympic Women’s Road Race this afternoon and something struck me as I watched. The American, Mara Abbot, was in the lead by over 30 seconds with a few kilometers left in the race. After a horrific crash by the Dutch cyclist, Abbott was alone in the lead. Behind her were three women, all from different countries. The three cyclists began working together as they cut into the lead. They would take turns leading, allowing the other two riders to draft, which allowed them to each conserve energy for the end of the race. Slowly but surely, the three women cyclists began gaining on the lone leader. She had no one to work with – no one to draft behind. My heart sank as the three cyclists passed the leader with the finish line in sight. The American cyclist who had been leading for so long ended up in 4th place while the other three cyclists took the gold, silver, and bronze. Sadly, there would be no medal stand appearance for American Mara Abbott. Team matters. Working together makes a difference. I remember early in my marriage when I would have a disagreement with my husband. Lee would often remind me – Kathy, we’re on the same team. We’re better together. And, 31 years later, I would say he is right. Every Sunday we have hundreds of children attend one of our three campuses. There is NO WAY I could begin to minister to hundreds of kids all by myself. I rely on a team. We MUST work together. The success of the ministry is dependent on it. I am incredibly blessed to serve alongside so many sacrificial servants. I love my team! Not only do I love to see our children’s team work together, but I love to see our families work together. Often on Mondays I will help count the tithes and offerings from the day before. By far my favorite envelope to open says TEAM Schultz – Every. Single. Week. I LOVE this!!! I love that this family sees themselves as a team. I love how they serve together and work together on service projects. I love TEAM Schultz! Have you ever seen the acronym for TEAM? – Together Everyone Accomplishes More. There is truth in that statement. Just ask gold medalist Anna van der Breggen of Netherlands, silver medalist Emma Johansson of Sweden and bronze medalist Elisa Longo Borghini of Italy. 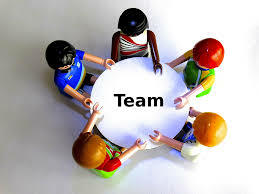 They can testify to the importance of working together as a team. What makes your heart beat fast? » Creating A R… on Prayer time!